Wed., Dec. 6, 2017, 8:53 a.m.
A GRIP ON SPORTS • At some point we have to lose our ability to get outraged at the Pac-12’s football awards. However, we have yet to reach that point. Read on. • Let’s go back to last season. Washington State’s Cody O’Connell was a consensus All-American guard. People who rated film without any prejudice saw him as one of the best offensive linemen in the nation. So did a lot of others. The Pac-12’s coaches relegated him to the conference’s honorable mention group. Let that sink in. Pro Football Focus, an organization without a dog in the hunt, graded every play and saw O’Connell as one of the best in the nation. Pac-12 coaches, who focus on whatever shiny object is their vision that day – mainly, money – didn’t rate him as one of the best in the West. The outrage was palatable around here – and once again the conference was held up to ridicule by the rest of the college football nation. It should happen again this season, but won’t. 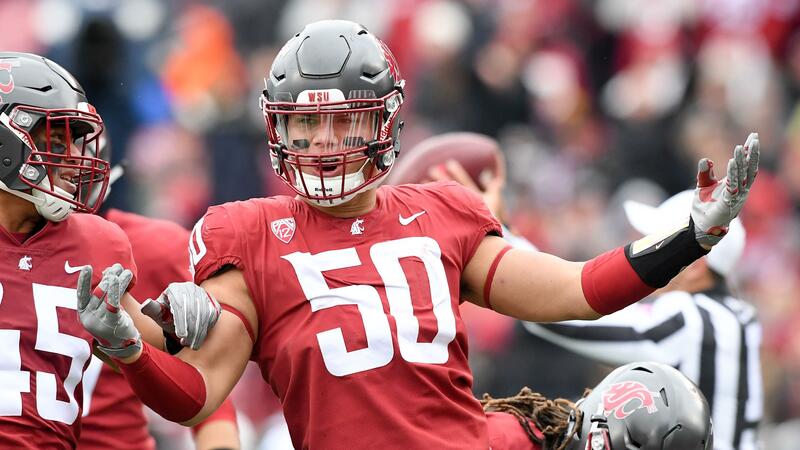 Yesterday, the conference’s coaches reiterated their belief Pullman is just east of Siberia, when they named Washington’s Vita Vea the Pac-12’s defensive player of the year instead of the Cougars’ Hercules Mata’afa. 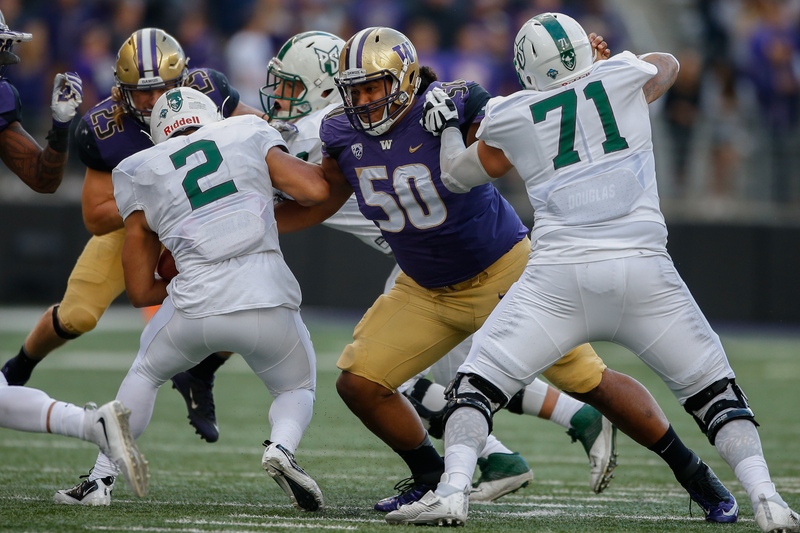 Vea is an excellent player who bull-rushed his way through the Cougars’ offensive line time and again in the Apple Cup. He is one of the best defensive linemen in the nation who had a really good season anchoring the conference’s best defense. He just didn’t have the season Mata’afa had. Not even close. Yes, Vea was double-teamed often. He had to be. So was Mata’afa. He not only had to be, it was mandatory because there was, for large stretches of the season, no one else on the WSU front who came close to being a game-plan wrecker he was. Control Mata’afa and you controlled the Cougar defense. The same couldn’t be said about Vea, who was part of a collective defense so good it was compared with the best in UW history. But that’s all subjective talk. The best way to judge is objectively. Using numbers. Isn’t that the way of the world in 2017? Vea was good. He had 38 tackles, 5.5 of those behind the line of scrimmage, including 3.5 sacks. Excellent numbers. All-Pac-12 numbers. So what does that say about Mata’afa’s season? He led the Pac-12 in sacks with 9.5. He had 43 tackles. He recorded an amazing 21.5 tackles for loss, 5.5 more than anyone else in the conference – and those accounted for 27 more yards lost than any other player. And, by the way, he forced two fumbles and recovered one. Those are the numbers, and the type of plays, that are made by conference defensive players of the year. All of them were made against offenses with one goal against Washington State: Control Hercules Mata’afa. Their offenses couldn’t do it. So the coaches did it with their pens. • Speaking of control, Villanova was in control throughout the Wildcats’ 88-72 win over Gonzaga in the Jimmy V Classic. All of fourth-ranked Villanova’s strengths were on display at Madison Square Garden. And all of the things Gonzaga needs to work on were on display as well. The undefeated Wildcats were as efficient offensively as anyone in college hoops. They moved the ball, shared it and made shots. And they were just as effective on the other end as well. The Bulldogs’ razor-thin bench, brought into even sharper focus with Corey Kispert’s ankle sprain, was on display as well. The Zags fell into the black hole of foul trouble early and never recovered. There was one shining light, however. Jacob Larsen is beginning to show he can make a difference inside, at least offensively. The 6-foot-11 redshirt freshman center from Denmark is still a step slow in his defensive rotations, but is starting to show a comfort level around the basket. It was needed last night as Johnathan Williams played only 18 minutes before fouling out. If Larsen, Rui Hachimura and Zach Norvell, who led GU with 22 points while starting in Kispert’s spot, can begin to show more consistency on both ends, the Zags’ bench will be just fine. WSU: You want rivalries? Idaho and Washington State will play at UI tonight. It’s the 273rd time the two have met on the basketball court. Theo Lawson has a preview of a series that features more games than any other west of the Mississippi. … There is also another rivalry game just a few miles west. Gonzaga’s women will visit the Cougars. Jim Allen takes a look at that battle. … Theo has two football stories, one on the All-Pac-12 selections and one on Mata’afa being up for another award. … The Times also has an award story or two. Elsewhere in the Pac-12, the biggest news is a defection. Willie Taggart spent less than a year as Oregon’s head coach before heading back to Florida. I know it rains a lot in Eugene, but it was that bad? … USC players won one court battle yesterday and lost another. … The Pac-12 offensive player of the year and coach of the year reside in Stanford. Really? The coach of the year was Clay Helton. Holding that USC group together wasn’t easy. … Arizona State’s football experiment is still drawing lots of discussion. … There will be a new look to Colorado’s offense next season. … The Utes aren't too excited about their bowl destination. … In basketball, Oregon State won at home, Utah lost at Butler and Arizona upset highly ranked Texas A&M in Phoenix. … Washington faces Kansas tonight. Gonzaga: Live from New York it is John Blanchette. OK, so that doesn’t have the same ring. Still, John has a column following the Villanova game. Jim Meehan has an analysis of what went wrong, a note on the margin and the three keys. … The photo report comes courtesy of the Associated Press. … We watched at home and put together a TV Take. … Some talented folks in the office put together highlights. … The game was played in Madison Square Garden, so there is national coverage. … Around the WCC, San Diego plays at New Mexico State tonight. … The BYU/Illinois State series is a Twitter creation. EWU: Former Eastern quarterback Josh Blankenship, 37, is the head coach at Adams State. … Around the Big Sky, Southern Utah had a memorable year in football. … The school faces a memorable basketball week. … Montana State had a less than memorable game at Central Michigan. The same can be said of North Dakota at Creighton. … Montana will play again in California while Idaho State hosts a California school tonight. … The athletic director’s departure is costing Northern Arizona a lot of money. CCS: The women won a basketball game last night. Chiefs: Kailer Yamamoto is always in demand. Preps: The first Tuesday night in GSL basketball action leads the way in our roundups of girls and boys action. … Though neither team realized their ultimate goal this season, St. George’s soccer program is on the rise. Seahawks: This is what I was trying to explain to my son Sunday. I just didn’t know it had a name. My physics teacher, Father Fintan, would have been proud I was at least thinking about the forces involved. … There have been many new Hawks who have stepped up and helped this season. Will it end in the playoffs? … As always, there were roster moves yesterday. Mariners: The M’s met with Shohei Ohtani in Los Angeles yesterday. And they should be a little optimistic they will be able to sign him. Published: Dec. 6, 2017, 8:53 a.m.